These French Christmas dessert recipes make delicious traditional French desserts to eat at home during the holidays. French Christmas desserts at dinner parties, family gatherings or pot lucks make for happy guests. The incredibly delicious Buche de Noel is one of many French desserts at Christmas. Some traditional desserts can only be found at Christmastime and are a wonderful addition to your holiday dessert repertoire. The culture of France adds proudly to the world of quality desserts and Christmas is no exception. The French genoise cake is the base to many French cakes. It is a sponge cake used in yule log recipes (buche de noel), ladyfingers, and in many French dessert recipes year-round. The Buche de Noel (yule log) is one of the most famous French desserts for Christmas. It’s traditional in households around France for Christmas dinner dessert. You start with the genois recipe to make the cake. French cusine history traces the Buche de Noel to Celtic times. This Christmas bread recipe is from Provence. Tastes like a sweet focaccia and is served as part of les treize desserts (13 desserts) which is traditional in Provence at Christmas. This fruit cake is a traditional cake from Provence served at Christmas and year round. It is light and delicious. Yes light, you read correctly. This is one of the easiest Christmas dessert recipes to make. French apple pie and French apple tart (tarte au pommes) are the same thing. In French baking there is no top crust on the pies. In our lingo we would call it a one crust pie or an open faced pie. Crème anglaise is a light custard sauce used with many French desserts. Its food history dates back to Roman times. Since the Romans were in France way back when, it made its way into the modern Food culture of France. 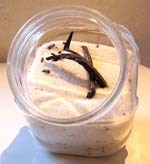 Vanilla sugar is used in many French dessert recipes and is very simple to make. It brings lovely flavor to desserts. Deliciously chock full of energy and nutrition with dried fruit and nuts. Year round try these classic French dessert recipes because everyone loves famous French desserts. As time permits I will be adding more traditional French Christmas desserts. When you subscribe to my blog you'll see all the updates as they come in. Go to top right of this page to signup. Images of vanilla sugar, Christmas fruit cake and Christmas bread courtesy Wikimedia Commons.